So, I'm considering being in the market for an embroidery machine. I don't know much about them, and don't think I know anyone with one. I'm not sure what to look for, and I'm not sure how to search for them. I want to be able to easily monogram things, and I may be interested in using my own designs eventually. I may eventually decide to have a small monograming/embroidery side to a business. Does anyone know anything about embroidery machines or have any advice? I look forward to any responses! I first learned about The Creative Family by Amanda Blake Soule last spring when it was mentioned in a traditions newsletter by Meg Cox. The description of the book intrigued me, and I checked out her blog immediately. I've been hooked ever since. I don't usually order or buy books without browsing them first, though. So I requested that my library order a copy (our city library has this feature that allows any citizen with a library card to request up to 5 books a month be ordered - I love this feature!). The library finally got the book in late summer, and I was pleased to discover that it's staying checked out. I've been a little slow, though, and just got my copy this week. Part of what I love about this book is that it's not just a book filled with craft projects. There are lots of projects, but she also talks a lot about her philosophy and why her family does things the way they do. The book has a very gentle tone, and I feel calmer when I read it. Even though it is largely a craft book, I read it just for inspiration. the banging wall - I wish sound didn't carry so well in our neighborhood. I'm trying to figure out a way to talk my parents into making one for the grandkids. Amanda has discussed the banging wall on her blog. I like the discussions of natural toys for children, and simple activities to do with kids to bring families closer together. This book has actually led me on a quest to learn sewing, to pick up my crochet hooks again, to seek natural materials, to think more intentionally about my parenting and to start my own blog. I am grateful to Amanda for writing this book, and my way of thanking her is to let you know how much I've loved it. I hope that you will seek out a copy of this book, and encourage your library to stock it too. I know this post is late, but I wanted to go ahead and share our Halloween costume this year. I purchased Abigail's original costume (ladybug) at a local consignment store's going-out-of-business sale over the summer, and then I saw this awesome costume at Pottery Barn Kids. I saw it hanging from the shelf, and exclaimed "What a great chocolate chip cookie costume!" My sister-in-law agreed, and picked it up. That's when we learned it was actually a giraffe costume. Normally, a giraffe costume would excite me also, but I'd already gotten obsessed with the idea of a chocolate chip cookie costume. I started searching the internet looking for similar costumes or patterns for what I wanted, but I could not find the right costume for a toddler (a sandwich board is great, but I needed something that would work in a stroller, too). There were many ideas for how to make this work over the course of several weeks, but in the end we whipped the whole thing out in 3 hours on a Saturday afternoon (just in time for the zoo's Halloween party). We had Abigail lie down on a folded out newspaper, then traced around her from her shoulders to her knees. Fortunately, we had enough muslin for two tries, because the first one was WAY too small. 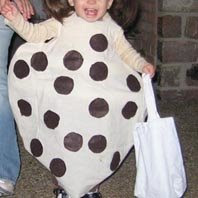 The costume is made out of muslin (for the cookie) and brown felt hot-glued on for chocolate chips. If I'd wanted a more durable costume, though, sewing the chips on would have been much better. Underneath, Abigail wore a pair of brown pants, and a long-sleeved shirt that I dyed using tea to make the right shade of brown (it was a hand-me-down that was badly stained - she may never have worn it otherwise). Her tote bag says "Got Cookies." I hoped that would give a clue about her costume. I've been surprised by the number of people who thought this was a ladybug costume. If I had to do it over, I'd use a darker muslin or tea dye the muslin I had, or perhaps even use dark tan felt. this is a great costume, but you glue it closed while the child is wearing it - not practical for a toddler!